Tim Rowe, professor of paleontology at The University of Texas at Austin's Jackson School of Geosciences, led the effort to describe the new dinosaur along with co-authors Hans-Dieter Sues, curator of vertebrate paleontology at the National Museum of Natural History in Washington, D.C., and Robert R. Reisz, professor and chair of biology at the University of Toronto. The description appears in the online edition of the journal Proceedings of the Royal Society B on Oct. 6. Sarahsaurus, which lived about 190 million years ago during the Early Jurassic Period, was 14 feet long and weighed about 250 pounds. Sarahsaurus was a sauropodomorph, a small but closely related ancestor to sauropods, the largest land animals in history. Conventional wisdom says that soon after dinosaurs originated in what is now South America, they rapidly spread out to conquer every corner of the world, so smart and powerful they overwhelmed all the animals in their path. Sarahsaurus challenges that view. One of the five great mass extinction events in Earth's history happened at the end of the Triassic Period 200 million years ago, wiping out many of the potential competitors to dinosaurs. Evidence from Sarahsaurus and two other early sauropodomorphs suggests that each migrated into North America in separate waves long after the extinction and that no such dinosaurs migrated there before the extinction. "We used to think of dinosaurs as fierce creatures that outcompeted everyone else," said Rowe. "Now we're starting to see that's not really the case. They were humbler, more opportunistic creatures. They didn't invade the neighborhood. They waited for the residents to leave and when no one was watching, they moved in." Sarahsaurus had physical traits usually associated with gigantic animals. For example, its thigh bones were long and straight like pillars, yet were not much larger than a human's thigh bones. Sarahsaurus shows that sauropodmorphs started out small and later evolved to a very large size. "And so it's starting to look like some of our ideas about how size and evolution work are probably in need of revision," said Rowe, "and that some of the features we thought were tied to gigantism and the physics and mechanics of the bones may not be right." Rowe is also intrigued by the new dinosaur's hands. "We've never found anything like this in western North America," he said. "Its hand is smaller than my hand, but if you line the base of the thumbs up, this small hand is much more powerfully built than my hand and it has these big claws. It's a very strange animal. It's doing something with its hands that involved great strength and power, but we don't know what." Sarahsaurus is named in honor of Sarah (Mrs. Ernest) Butler, an Austin philanthropist and long time supporter of the arts and sciences. Butler chaired a fundraising committee for the Dino Pit, an interactive exhibit Rowe helped create at the Austin Nature and Science Center that encourages children to dig up their own fossil replicas. The Dino Pit had been talked about for 20 years, but fundraising efforts stalled until Butler became chair. "I told her if she really raised a million dollars to build the Dino Pit, I'd name a dinosaur after her," he said. 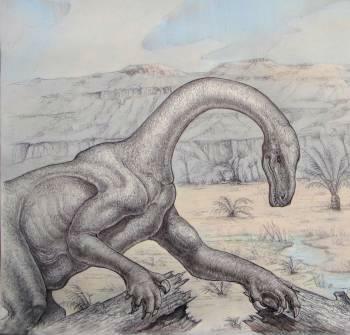 A team of researchers and students led by Rowe discovered Sarahsaurus on a field trip in Arizona in 1997. To reach publication, the team had to obtain excavation permits, excavate the site over three years, remove each fossil fragment from surrounding rock, measure and analyze each piece, and CT scan pieces to study internal structures. "It took me 13 years, but I'm delighted by the great success of the Dino Pit, which hundreds of thousands of kids have now visited. And also that we had the luck to make a find of suitable importance to carry Sarah's name."